The official story on this just sounds totally made up. 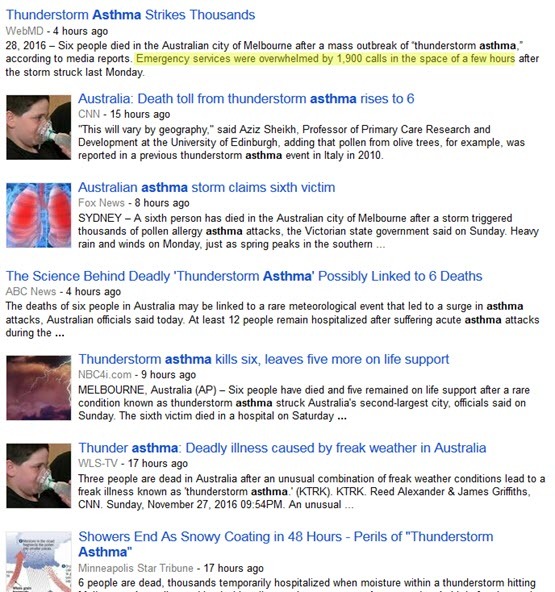 More than 8,500 people were hospitalized last week and six have now died in Australia due to what is being reported as a rare phenomenon known as “thunderstorm asthma”. Right now if you search for this story on Google News Australia, there isn’t a peep about it in the top news. You have to type in the word “asthma”. Then it’s like a horror show. “When we’ve had people calling for ambulances – one call every 4½ seconds at the peak – it was like having 150 bombs going off right across a particular part of metropolitan Melbourne. What officials are suggesting happened is that pollen grains from rye grass fields surrounding Melboune were blown across the city just before a sudden downpour. 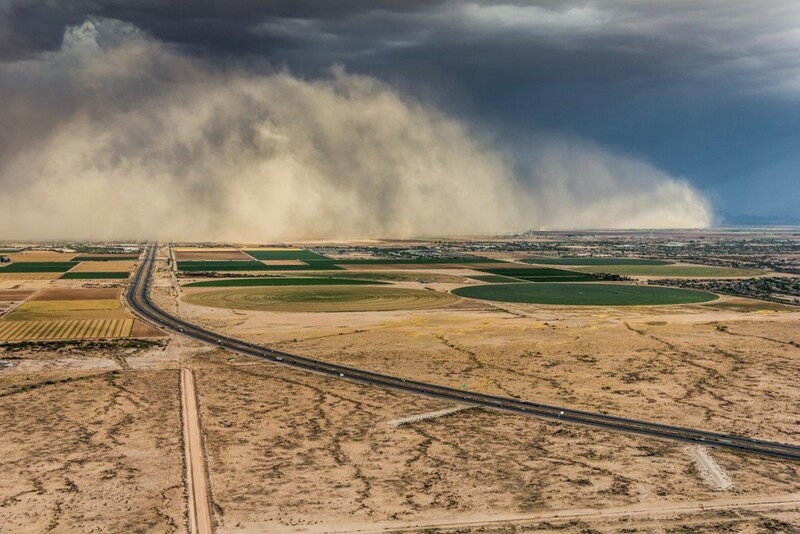 Once the rain hit, the pollen grains absorbed the moisture and burst in the air, releasing thousands of much smaller allergen nanoparticles that were inhaled and became trapped in people’s lungs. Once the rain stopped, thousands of people began suffering asthma symptoms all at once, everything from breathing issues to cardiac problems. Some people suffered heart attacks. Six people have died so far. One girl died in her family’s arms in their front lawn after waiting more than half an hour for an ambulance. The system was completely overloaded. Apparently in Melbourne they ran out of ambulances and had to resort to every other emergency and even non-emergency vehicles they could find to help get people to the hospital. More than 60 people are still in the hospital, some in critical condition fighting for their lives. Officials claim this can occur when weather conditions suddenly change, but in an era where they’re trying to get us to believe in man-made climate change, I call B.S. Doesn’t that just sound ridiculous on the surface? The weather suddenly changes all the time. If that’s really all it is, why doesn’t this “rare phenomenon” happen a lot more often? The official story sounds fishy to say the least, which is why speculation has risen that some kind of biological warfare agent is being tested. Sure, that’s conspiracy talk, but for once the conspiracy sounds a hell of a lot more plausible than the official narrative of “thunderstorm asthma”.